Verónica Reyes is the author of Chopper! Chopper! Poetry From Bordered Lives (Arktoi Books, 2013). She is a Chicana feminist jota poet from East Los Angeles. She scripts poetry for her communities: la jotería, Chicanas y Mexicanos. She has received grants and fellowships from residencies, such as the Montalvo Arts Center. Her work has appeared in Calyx, Feminist Studies, North American Review, and the Minnesota Review. Currently, Reyes teaches at California State University, Los Angeles. “El pueblo unido jamás sera vencido//La jotería unida jamás sera vencida.” Xicana Power! Jota Power! In the air, I felt it. These fourteen mujeres voices needed to be here. To claim space. Establish our existence. In this society, the written text is valued. La palabra sets the boundaries as what gets recognized and what gets excluded. Chicana writing plays a pivotal role in breaking down puertas. Xicana jota literature must fight through many barriers. Our writings are a necessity. At the AWP Annual Conference & Bookfair in Minneapolis, the frigid air outside planted the yearning for warmth. So many writers were excited to meet old friends. I saw young writers feel at home. This was their community. But then I felt a knot inside me. I scanned the book fair and the hallways. It slapped me. Most of these writers were white. I looked for poets/writers who mirrored me: a Mexican American butch dyke. Immediately, I understood Latinas/os were just a smudge of color in this mass. And this pissed me off. I was not going to accept: Brown, queer or straight, authors “absent” at this major writers’ event. So I invited Xicana—dykes and straight—writers and proposed three events. El Centro’s morning sol draped the sky, the buildings, and the cracked sidewalks with the yawn of light. On Pico and Venice, I stepped off the bus. Breathed in downtown’s morning: warmth, cars, dust. Strolled up Pico to Figueroa, the clatter of skyscrapers’ noise stammered. The Los Angeles Convention Center was booming. Strutted up the walkway and saw an old friend, Wanda, my fellow Chicana dyke, the moderator for the Jota panel. Her face, her embrace, her queerness, her cariño, said it all why our presence was necessary. All the readings were awesome. 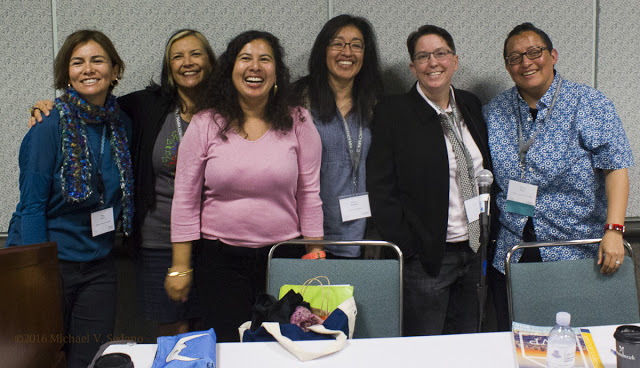 “Jotas: A Chicana Lesbian Reading by Barrio-Based Writers” event was amazing. 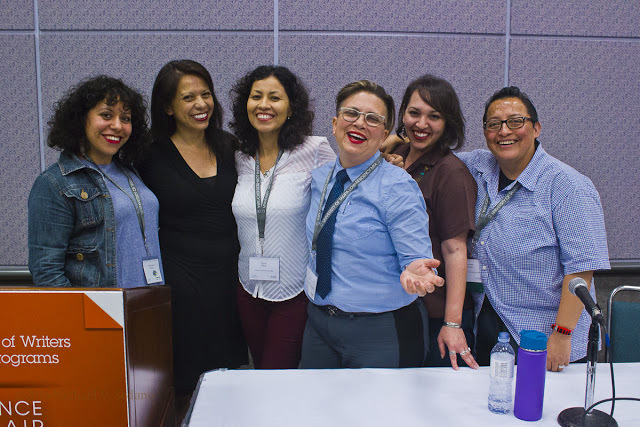 The writers—Wanda Alarcón, Verónica Reyes, Claudia Rodríguez, Griselda Suárez—performed their work to a beautiful audience who dared to attend the first session. Alarcón’s framed the importance of Xicana jota literature and today’s plight. They absorbed their words and gave a beautiful embracing applause. Feminist poetry filled the room about East L.A. tacos dorados via Long Beach, chanting of power in the room, and culminating with the hiss of spray paint from a Compton poet. Everything was blaring pride. “¡Chicana! Power! A Firme Tejana-Califas Reading.” These writers— Xochitl-Julisa Bermejo, Anel Flores, Guadalupe García Montaño, Laurie Ann Guerrero, Emmy Pérez—were mesmerizing. Joy was pulsing in the room. García Montaño introduced each writer and the authors empowered the room with stories set in San Antonio, Río Grande Valley, L.A., and la frontera. The lives of immigrants were honored. Cariño for familia bloomed in the room. “Puentes=Bridges: A Queer-Straight Mujeres Reading” presented Olga García Echeverría, Estella González, liz gonzález, Melinda Palacio, and Karleen Pendleton Jiménez. The audience mirrored puentes. The event was a beautiful roundabout. Each writer introduced the next one. It honored bridges and the support of each other. The readings explored a hotel Juárez, the Inland Empire in the seventies, an East L.A. memoir for her mama, and shared the road to butch pregnancy. Questions flew in to the writers. The room enveloped the love of literature from laughter, to tears, to pride. It was a beautiful culmination. Photos: (top) firma tejana-califas readers. (bottom) Puetes=Bridges readers. Photo credit: Michael Senado. Major support for Readings & Workshops in California is provided by the James Irvine Foundation  and the Hearst Foundations . Additional support comes from the Friends of Poets & Writers .